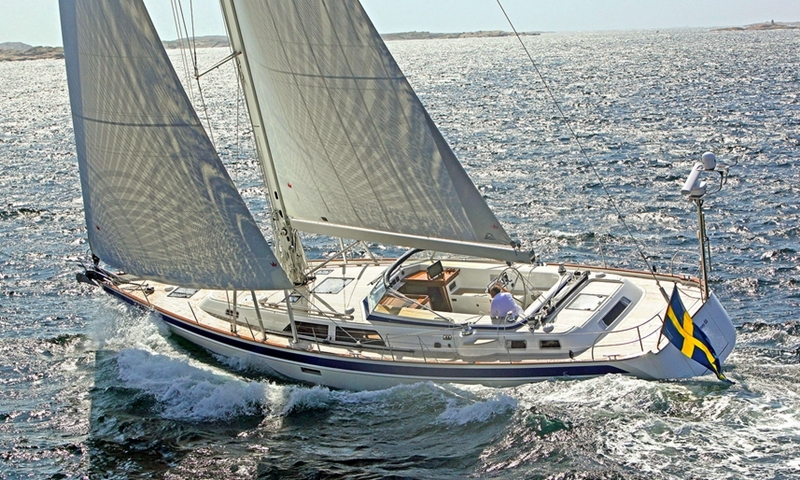 The Hallberg Rassy lines are unmistakable on the 412, a newly designed hull that has quickly become an instant success. 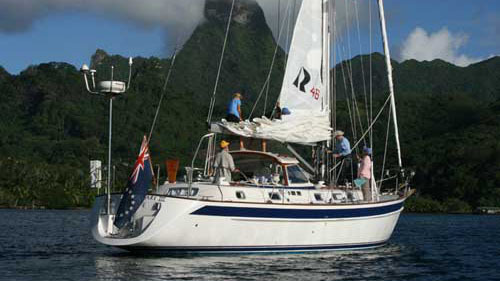 Built on a newly designed hull, the aft cockpit Hallberg Rassy 412 seems to be an instant hit. 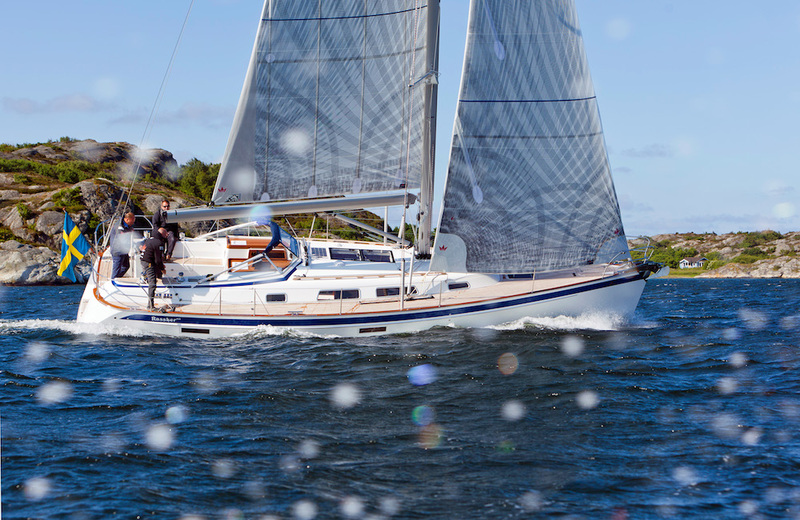 With unmistakable Hallberg Rassy lines, their signature windshield and a reputation for durability and quality a mile long, the first of the model to grace our shores immediately got attention and garnered compliments from seasoned East Coast sailors. Hull #28 briefly sailed the Chesapeake Bay before being shipped to her new owner in the Great Lakes where she’ll probably be lovingly caressed in a heated shed all winter and then finally commissioned in her new home. Hallberg Rassys are Swedish icons that are built to order so there aren’t that many about, but heads do snap around when one sails by. They elicit images of tough boats battling high winds and brutal seas in remote icy archipelagos. But to our surprise, the HR 412 is a delightful light air sailor and a lot of fun on lazy days on the Bay with dolphins gliding slowly by. Ready for lazy days on the bay? 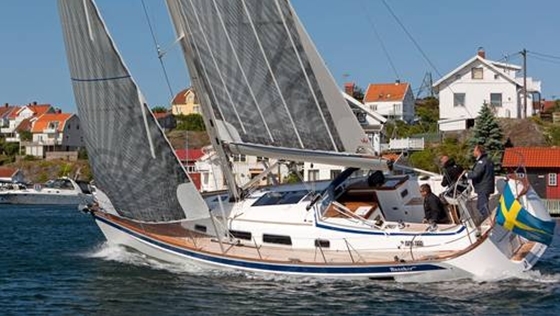 The Hallberg Rassy 412 is your ticket to relaxation. The flat waters of the Chesapeake briefly served up 12 knots over the deck one sunny morning, just long enough to see the HR 412 pick up her skirts and scoot along. At 40 degrees apparent wind angle in 11.8 knots of wind, the Danish Elvstorm sails (including the 111 percent genoa) drew us along at 6.8 knots. As we eased off, we still carried four knots at 120 degrees in 6.4 knots of apparent wind. The deck-stepped, triple-spreader spar is by Selden with an air draft of 64’ 6”. That means the HR 412 will not be ICW-friendly. The standard sail area is 970 square feet. 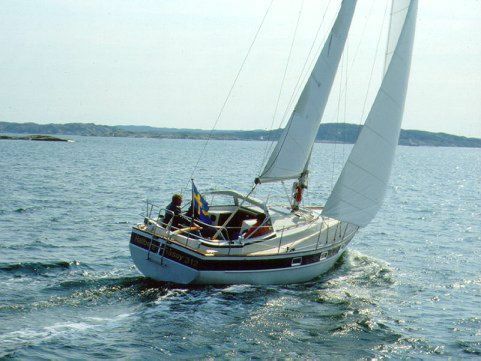 For short-handed sailing, the best combination would be a self-tacking jib with a large Code 0 for downwind work. 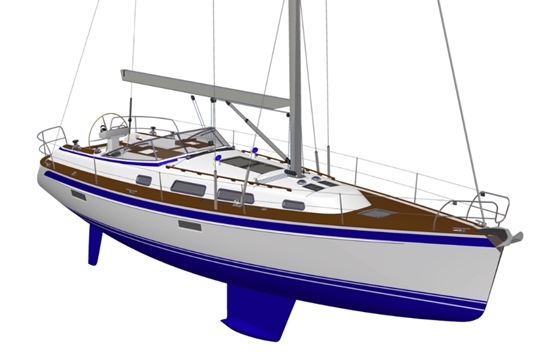 With a traditional mainsail (an in-mast furler is optional) and a large jib, aspirations of club racing can also be expected. A large racing-style wheel adds a look of serious performance to the deep cockpit. The central instrument console is comprehensive with a 12-inch Furuno (or Raymarine) multifunction display (MFD), a Fusion stereo head, and a remote anchor windlass control so the hook may be dropped right from the wheel. Joysticks for the optional Side-Power bow and/or stern thrusters are also on the console as is the engine throttle so there’s no need to bend down to shift into reverse and take your eyes off the bow when docking. As the wind died and we headed back to the slip under power, the Volvo-Penta D2 75 HP diesel and Saildrive delivered 8.5 knots at 3000 rpm. A more economical cruising speed is 7.5 knots at 2100 RPM. With two overhead hatches and an L-shaped settee, the saloon makes for a very comfortable area onboard. Layout choices include two or three cabins with one or two heads. The master stateroom, which is forward, offers a few more options including a head with or without a shower stall and a standard V-berth or center island bed. The saloon has two opening hatches overhead and opening ports in the cabintop for lots of ventilation. An L-shaped settee wraps around a drop-leaf table that connects with either two built-in chairs or a straight settee on the other side. The head is to starboard and the C-shaped galley is to port with twin sinks, a top-loading refrigerator, a small separate freezer, and a two-burner stove and oven combination. 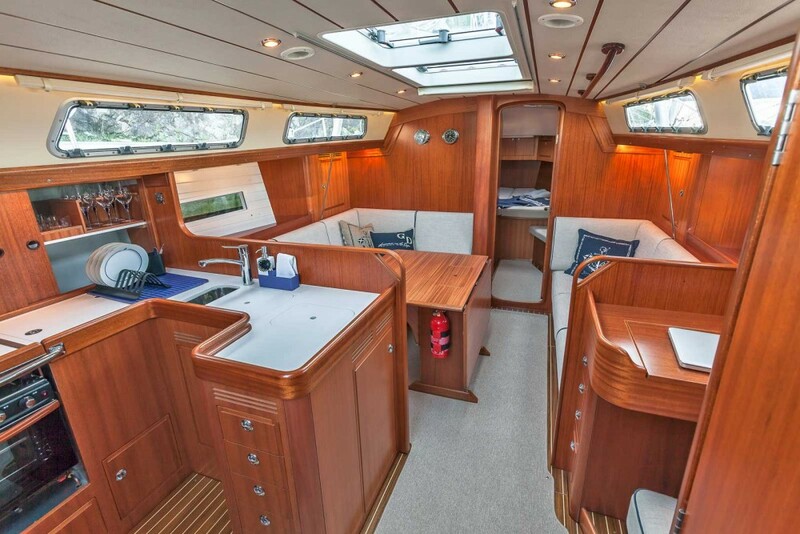 The interior is finished in gleaming mahogany with excellent joinery that Hallberg Rassy is known for. When drawers fit tightly and doors close smoothly, you know you’re working with a higher level of fit and finish than is typically found on production builds. The house batteries are below the saloon settees and they are wet cells that generally provide a deeper discharge and a longer life. The separate thruster battery is forward and is AGM so there will be no need to crawl below the master berth for any maintenance. 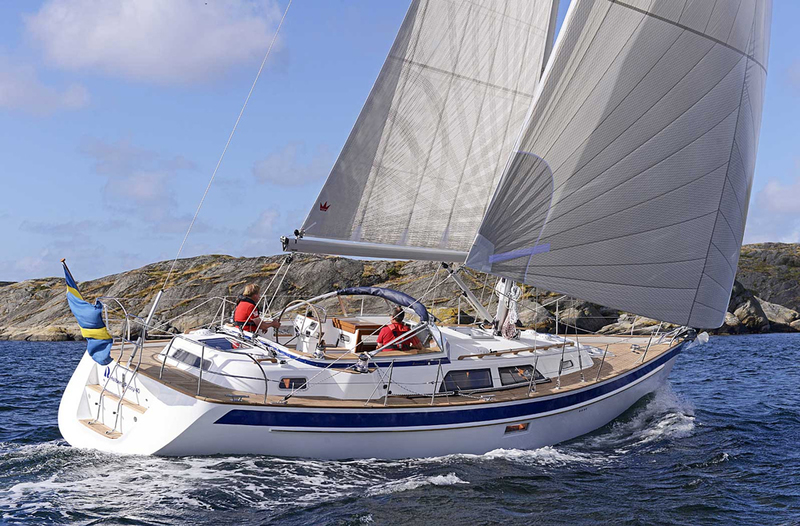 German Frers has been Hallberg Rassy’s exclusive design firm since 1988 and all their models (31-64 feet) have a traditional aesthetic. The hulls have no hard chines or plumb bows, just a lovely sheer and a low profile. The Divinycell foam core sandwich construction has an integral grid that reinforces the hull. The deck is added before the furniture and equipment is installed so everything comes in via the companionway and it can exit the same way when it’s time to repower or replace anything else. 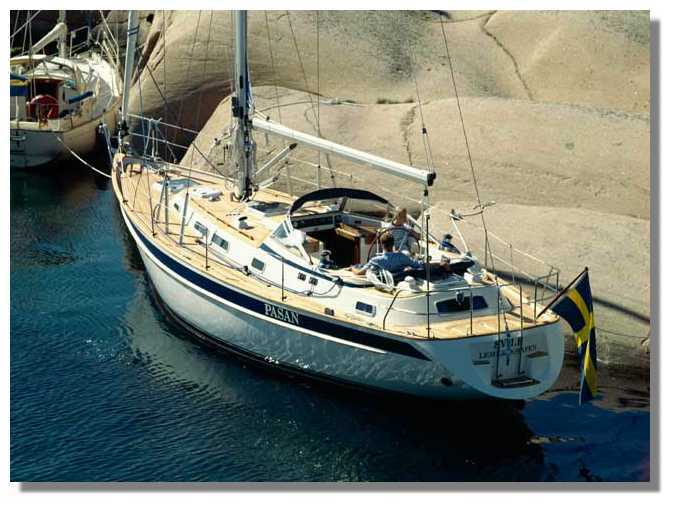 Like all Hallberg Rassys, the 412 has a practical air about her and exudes the capability to take on a serious ocean. But since not every day necessitates a victory at sea, it’s good to know she can be a boatload of fun on calm, sunny mornings when the breeze is fluky and the dolphins are lazy.